Work Day – Nov 15th! What we’ll be doing: We will continue (again) the work on the upper part of the Bridal Veil Falls trail (south side). This may be the LAST time we work this area until next fall. We’ve done a lot with this area so far so let’s finish strong! The Forest Service will provide us with more excavator work that will need to be groomed and there’s some general trail and culvert maintenance that needs to be taken care of. The weather forecast looks good so far for the work day but be sure and check it the day before so you can dress appropriately. As always, all tools will be provided! Be sure and bring your own drinking water, sun protection, work gloves and study boots. As always there will be work for all skill level and ages. When/Where: Saturday, November 15th, 2014. Meet at 9am and we’ll work until noon. Meet at the upper trailhead of the Bridal Veil Falls trail. A link to the map and further directions are below if you need them. 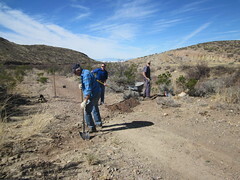 The work area will be about 1/2 mile down trail from where we’ll meet. Directions to the Bridal Veil Falls Upper Trail head from Hwy 82 in High Rolls (click this link for a Google map): From Hwy 82 in High Rolls, turn north at the High Rolls General store onto Cherry Blossom Lane for .3 miles, the west (left) at the stop sign onto Cottage Row. Drive .45 miles and turn north (right) onto Fresnal Canyon Road and travel .9 miles to the upper trailhead on the left. This is also the location of the lower trail head of the Grand View Trail. If didn’t join us over the last several months and you’ve never been to Bridal Veil Falls, this is another great opportunity! Work Day – Oct 18th! What we’ll be doing: we will continue the work on the upper part of the Bridal Veil Falls trail (south side). The Forest Service has just completed some more ditching along the trail bed using their excavator and we need to theadjusting and clean up to provide the proper erosion control. The trail saw a lot of erosion damage this past summer. All tools will be provided! Be sure and bring your own drinking water, sun protection, work gloves and study boots. Depending on how the weather looks on Saturday, you may want to bring rain gear as well. As always there will be work for all skill level and ages. When/Where: Saturday, October 18, 2014. Meet at 9am and we’ll work until noon. Meet at the upper trailhead of the Bridal Veil Falls trail. A link to the map and further directions are below if you need them. The work area will be about 1/2 mile down trail from where we’ll meet. Directions to the Bridal Veil Falls Upper Trail head from Hwy 82 in High Rolls (click this link for a Google map): WARNING! The Apple Festival will be going on the weekend of the work day! We suggest you leave just a bit earlier than normal to make it to the meet up on time. Also, consider the slightly different route than what you may normally take (link to the alternate route in Google Maps above): The Harris Hollow gate is north of High Rolls. From Hwy 82 in High Rolls, turn north at the High Rolls General store onto Cherry Blossom Lane for .3 miles then turn RIGHT (east) at the stop sign at Cottage Row. Very soon after you take that right, take a sharp LEFT onto Railroad Drive for about .5 miles and turn right (north) onto Fresnal Canyon Road and travel .9 miles to the upper trailhead on the left. This is also the location of the lower trail head of the Grand View trail. Work Day – Sept 20th! What we’ll be doing: We’ve decided to continue the work we started earlier this year on the upper part (south side) of the Bridal Veil Falls trail. We’ll be repairing erosion damage and improving erosion control on the rail bed. We’ll also be making some improvements on a culvert we installed some time back. As always, we’ll of course be doing any general maintenance and brush trimming the trail may be in need of. All tools will be provided! When/Where: Saturday, September 20, 2014. Meet at 9am and we’ll work until noon. Meet at the upper trailhead of the Bridal Veil Falls trail. A link to the map and further directions are below if you need them. 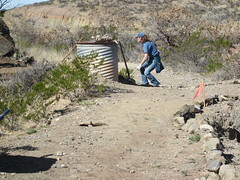 The work area will be about 1/2 mile down trail from where we’ll meet. If didn’t join us over the last couple of months and you’ve never been to Bridal Veil Falls, this is another great opportunity! 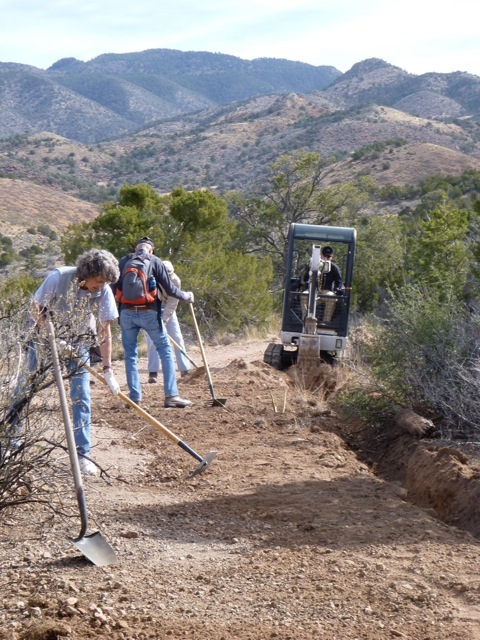 What we’ll be doing: Continue brush trimming, tread work, and similar trail maintenance on the Switchback Trail, mostly on the western end going upgrade from the shelter. 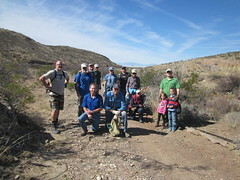 We may end up splitting a group out to go down the trail into the canyon below the Harkey Pedestrian Bridge to clear some piles of brush and branches left behind after some previous trail maintenance work. This area is high altitude, so it shouldn’t be too hot. Be sure to bring drinking water, sun protection, work gloves and sturdy boots. All tools will be provided. There’s work for all skill levels. When/Where: Saturday, August 16th, 2014. Meet at 9 am; work until noon. Meet at Bailey Canyon Rd (just 2 miles west of Cloudcroft, off Hwy 82) . We plan to work until about noon (we will vacate early in the event of a thunderstorm). We won’t be doing “heavy stuff,” so just about everybody can help. The trail in general is in good shape because it sees a lot of hikers, but in many places, the weeds have narrowed the path to about 1 1/2 feet; supposed to be 3 to 4 feet wide, and some bushes/tree branches are crowding the walking area. We plan on having a couple of gas driven weed eaters available to make clearing of the low weeds easier. 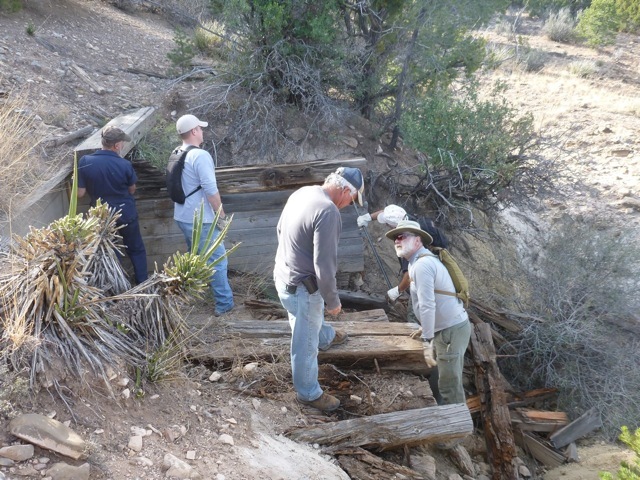 What we’ll be doing: We will be working be working the same area as last month — on the upper part of the Bridal Veil Falls Trail repairing erosion damage and improving erosion control on the railroad. We were hoping we’d have the necessary wood and hardware to begin rebuilding the large erosion control structure that was object of last work day’s demolition effort. With that in mind we will start construction of a needed new culvert where an original culvert was thought to exist but has since disappeared. 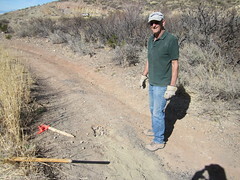 We may also do some more trail maintenance in the area. 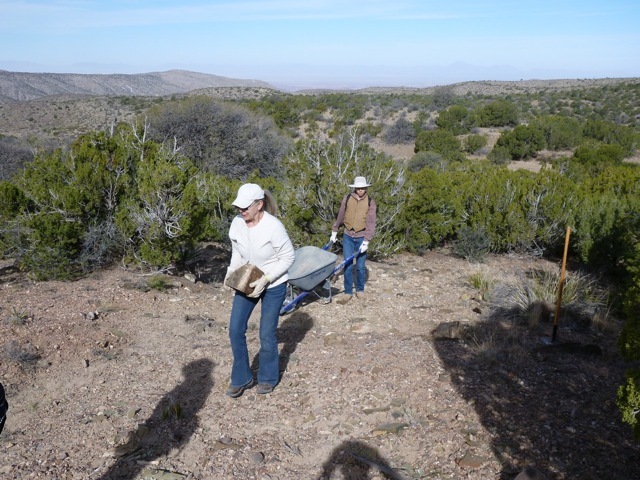 Be sure to bring your own drinking water, sun protection, work gloves and sturdy boots. All tools will be provided. We plan to work until noon. When/Where: Saturday, April 19, 2014. Meet at 9 am; work until noon. Meet at the upper trail head of the BVF Trail …directions below. The work area is about 1/2 mile down-trail from that point. Directions to the Bridal Veil Falls Upper Trail head from Hwy 82 in High Rolls (click this link for a Google map): The Harris Hollow gate is north of High Rolls. From Hwy 82 in High Rolls, turn north at the High Rolls General store onto Cherry Blossom Lane for .3 miles, the west (left) at the stop sign onto Cottage Row. Drive .45 miles and turn north (right) onto Fresnal Canyon Road and travel .9 miles to the upper trailhead on the left. This is also the location of the lower trail head of the Grand View Trail. What we’ll be doing: We will be working be working the same area as last month — on the upper part of the Bridal Veil Falls Trail repairing erosion damage and improving erosion control on the railroad We will have the necessary wood and hardware to begin rebuilding the large erosion control structure that was object of last work day’s demolition effort. More of the original wood will need to be replaced than originally thought, so the total effort will be a little larger than initially anticipated. 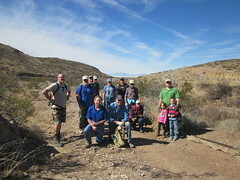 We may also do some more trail maintenance in the area. Be sure to bring your own drinking water, sun protection, work gloves and sturdy boots. All tools will be provided. We plan to work until noon.